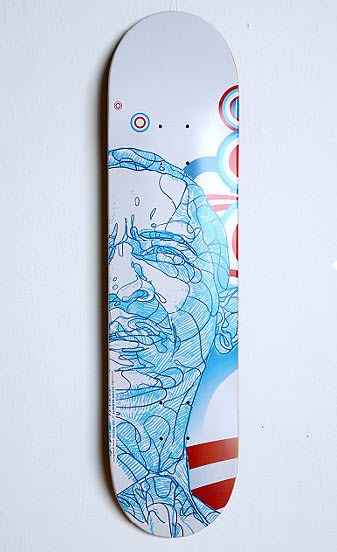 Created by Ohio-based graphic artist, Oliver Barrett, this incredibly hard to come by limited edition decorative skateboard deck features a pop-arty and oh-so-contemplative Barack Obama at the underside and a red wood-grained top. Hang it like wall art and it’ll preside over your living room. And though you’ll have to trade sweet jumps for a decorative collector’s item, it’s an exchange we can believe in. Made in the USA. Wipe clean. Here’s direct link to the product page. I figured maybe you’d be interested in an artist I am featuring on my site. He’s an amazing sculptor/painter who uses modern US coins as his medium. His latest work is a portrait of Barack Obama made up of pennies and nickles. I think i remember what skate deck that is, mountain. I was skated sims at that point, It might be a custom skate deck.